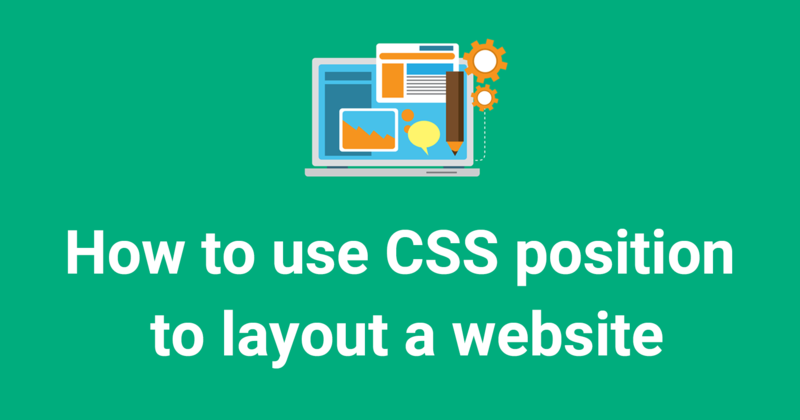 Using CSS position to layout elements on your website can be hard to figure out. What’s the difference between absolute, relative, fixed, and sticky? It can get confusing pretty quickly. To help, this tutorial will guide you through all the CSS position properties. And you’ll be able to get your website layouts pixel perfect! What does CSS position do? Using CSS, you can layout all your elements on your webpage visually. For example, you can position an element at the very top of your page, or 50px below the element before it. The position property can take five different values: static, relative, absolute, fixed, and sticky. It sounds like a lot, but don’t worry! Position: static is the default value that an element will have. This means if you don’t declare position for an element in CSS, it will automatically be set to static. Elements that are statically positioned will appear on the page in what we call the normal flow. For example, if you have multiple <div> elements one after the other, they will appear on the page directly below one another. The second element has a top property set to 50px. You would think that this would move it down 50px, right? See the Pen Position Static by Jessica (@thecodercoder) on CodePen. Since both elements have a static position, none of the layout CSS properties will do anything. This makes that top property have no effect on how the second element is displayed. So that second element ends up being directly below the first element, with no space between. Position: relative is similar to static in that relatively positioned elements will follow the normal flow of the webpage. But the main difference is that using relative will now unlock the other CSS layout properties. Think about it this way: you are setting the element to be positioned relative to other elements on the page. All the CSS is exactly the same, except that we changed the second element to use position: relative. Doing this makes that top: 50px work! See the Pen Position Relative by Jessica (@thecodercoder) on CodePen. You can see that the second element is now 50px below the first one, adding that space between them. Let’s try another example, using a parent element with a child element nested inside it. Both have position: relative set. See the Pen Parent-Child, Using Position Relative by Jessica (@thecodercoder) on CodePen. Position relative is relatively straight-forward, right? Well, hold on to your hats, because things are about to get crazy with position absolute. Position: absolute will cause an element to be taken out of that normal flow of the webpage. So before, using static or relative positioning, elements would be nicely displayed one below the other, depending on their order in the HTML markup. But with absolute positioning, the element is completely taken out of that entire flow. To help explain, let’s do a comparison to illustrate the difference between relative and absolute positioning. In the previous example, we had a parent element with a child element, both positioned relatively. And the child was nested inside the parent element. Let’s change that child to be positioned absolutely in the parent! See the Pen Parent-Child, Using Position Absolute by Jessica (@thecodercoder) on CodePen. The pink child element now looks very different from our last example. While it is still within the confines of the parent element, it is positioned at the very top and very left of the parent. It’s even covering up the parent text content! This is due to the top: 0px and left: 0px styles of the child, combined with the child being absolutely positioned. In the normal flow of things, elements wouldn’t be on top of (and covering up) other elements. But since the child is absolute, it’s essentially on a different layer than the normal elements. So it can be positioned on top of what else is on the webpage. But it will stay within the boundaries of the parent element– as long as the parent has its position set. Which leads us to our next point. An absolutely positioned element needs to position itself in relation to a positioned ancestor. When you take an element out of the normal flow by using position: absolute, it will look for an ancestor element that has its own position set. This is so the child knows what element it should position itself in relation to. So what happens if a child element is absolutely positioned, but the parent element doesn’t have a position set? See the Pen Parent-Child, with non-positioned Parent by Jessica (@thecodercoder) on CodePen. The child has now escaped the confines of the parent element, since the parent has no position set. And the child has gone up to the next (grand)parent element, in this case the <body> element, which is as far as it can go. This is a huge cause of unexpected behavior in CSS for many developers. The main difference between relative and absolute positioning is that position: absolute will take a child element completely out of the normal flow of the document. And that child will be positioned in relation to the first parent element that has its own position set. The last two position values, fixed and sticky, are similar in some ways to position: absolute. But they also are related to your scroll position on the page. Position: fixed will take the element out of the normal flow, and also position it in the same place in the viewport (what’s visible on screen). This means that scrolling will not affect its position at all. See the Pen Position Fixed by Jessica (@thecodercoder) on CodePen. The green fixed element will stay positioned to the top and left corner of the viewport. And if you scroll, the purple element will scroll up normally, but the green element will remain stuck to where we positioned it. Tip: A fixed element must have a top or bottom position set. If it doesn’t, it will simply not exist on the page at all. Position: fixed is commonly used to make navigation bars that are always affixed to the top. It’s a super helpful property! Next, we’ll take a look at sticky positioning, which is like fixed positioning but with a little extra. Position: sticky elements will initially behave like position: relative elements, but if you keep scrolling, they will get taken out of the normal flow and behave like position: fixed wherever you have positioned them. This can be really useful if you want to stick an element that’s initially farther down the page to the top of the screen. And here’s what it looks like on the webpage! See the Pen Position Sticky by Jessica (@thecodercoder) on CodePen. As you scroll down the page, when you see the green element come into the viewport, it seems like a normal, relatively positioned element. But as you keep scrolling, instead of scrolling off the page, it will become fixed and stick to the top of the viewport. Just like fixed elements, a sticky element must have top or bottom set in the CSS. If it doesn’t have it, the element will continue to behave as if it was relatively positioned, and will never become sticky. Thank you so much! Awesome work!